I’m so glad to hear that, Dan. I look forward to reading your post. These last couple of weeks I’ve had such little time to give to the blog. And I’ve missed reading other people’s blogs. Babe, sometimes you really make me cry…. RAB, I am always cheered when I make you laugh or cry. Thank you, ShimonZ. You encourage me. Your posts are lovely launched ships that are wonderful to reach down and pick up 🙂 this is delightful! I’m glad you liked it, Bella. You have launched many word ships on this site, and we, your readers, are ever eager to take a cruise on them! Thanks so much for writing! Thank you, Ruth. And thank you for reading. Very clever and pretty too. Wonderful! 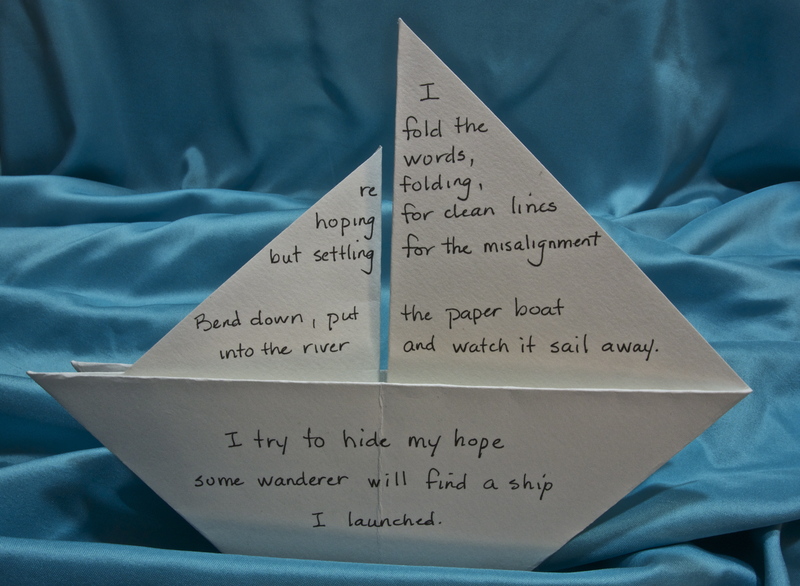 I love how you’ve brought three arts together: origami, writing and living. You’ve captured the fears and hopes of all three in just a few lines. It makes me glad that you like it.